Queensland in Australia not only the finest place for tourists sightseeing some of the alluring places like Great Barrier Reef, the Daintree Rainforest, and the Whitsunday Islands but the central and capital city Brisbane is most popular place in Australia with the intensifying economy standards, the World Class Infrastructure, diversity in the culture, ease of life for foreign workers attracting the world. With the thriving business sector, Brisbane is in dire need of skilled human resources. As we all know that Australia geographically the sixth largest country in the world but not in the population. 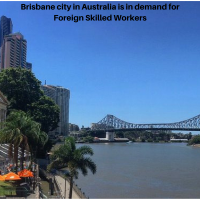 Therefore Brisbane is in need of foreign skilled workers; the recent reports stated Skilled Occupation list of Queensland had announced the percentage of skilled workers required and how many immigrants need to Immigrate to Australia. All these skilled workers have the chance to move to Brisbane under skilled immigration path. Talking about the living cost in Brisbane, it is very economical when compare to other states in the Australia. This city is the safest place and reasonably affordable for living along with the family for International immigrants.